What a difference the wind and waves (or lack thereof) can make. Our next destination is Antigua, almost due East from St. Kitts. We are traveling West to East and the trade winds blow East to West. We wanted to have a calm day to make the passage because it can be very uncomfortable heading straight into the wind. We wished for a calm day, and we got it. 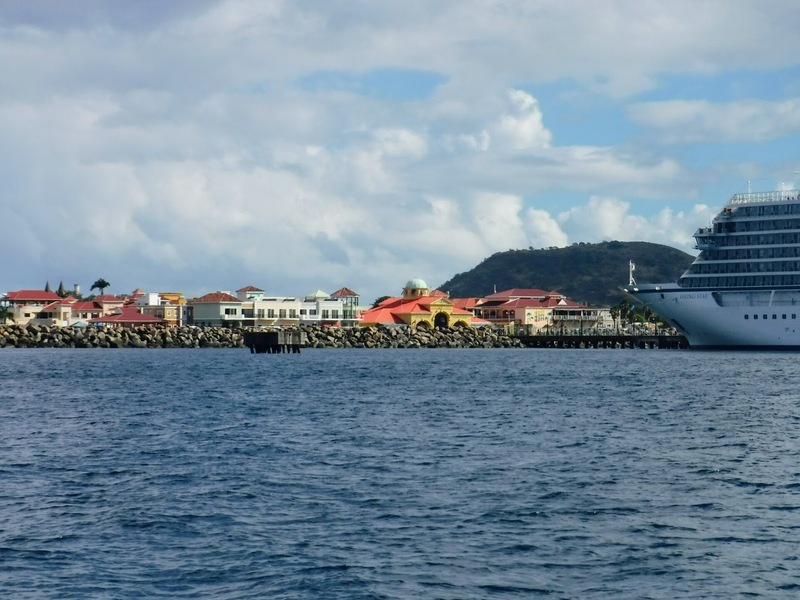 Three cruise ships were in when we pulled in to the harbor at Basseterre, St. Kitts. All three left in the evening to transport their passengers through the night to the next port. That seems to be pretty standard for cruise ships around here. We often see them pulling out in the evening or cruising by at night, like well lit apartment buildings on the ocean, large floating light shows. One of the cruise ships on the pier. The yellow building is the entrance to Port Zante. Sailing at last! 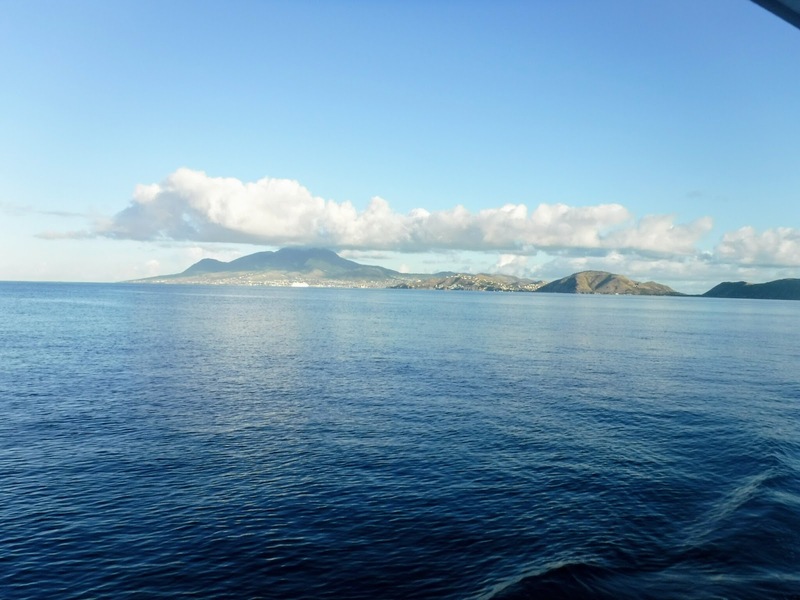 We were able to sail the entire way from St. Barts to St. Kitts. Not motor, not motor sail, but actually sailing. That was the good part. The challenging part was the wind. 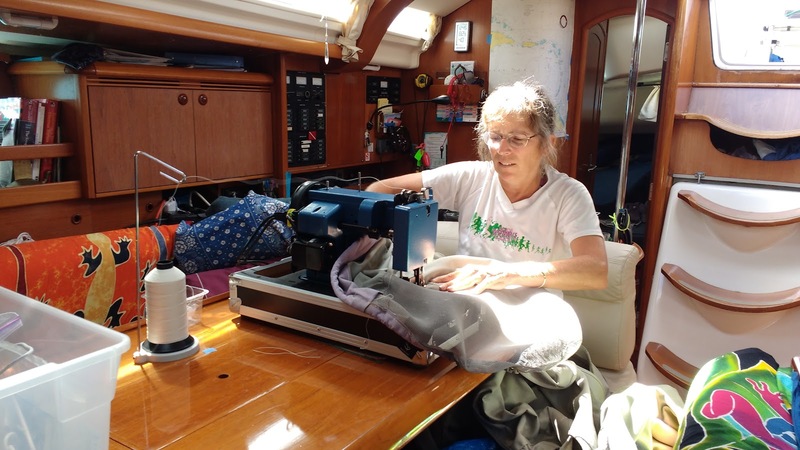 We picked this particular day to go because the winds were forcast to be 14 - 18 knots, a very pleasant speed for Rhapsody to sail in, and less wind than had been blowing the previous days, or was forcast for the following days. We thought we had a good weather window. 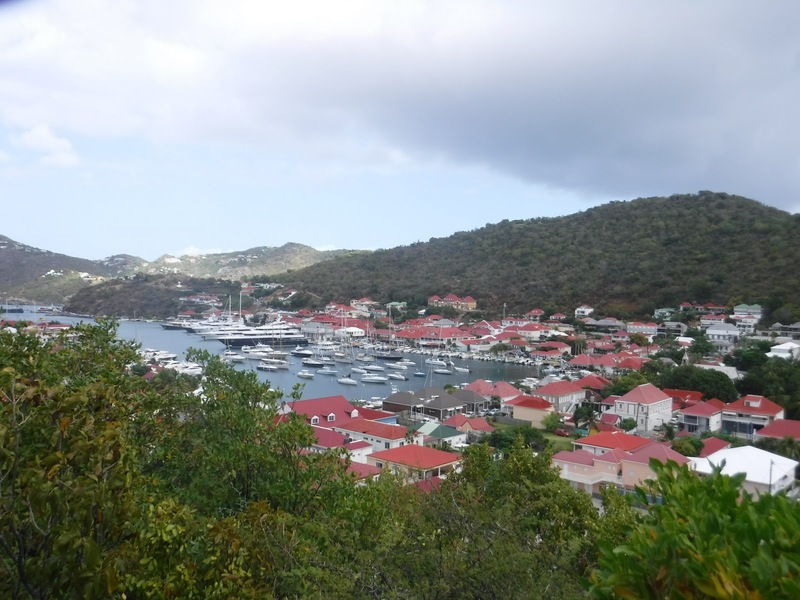 It is difficult to compete with Dave Barry when he gives a description of St. Bart. He explains well what we experienced there. Click here to read his description then come back, I'll wait. 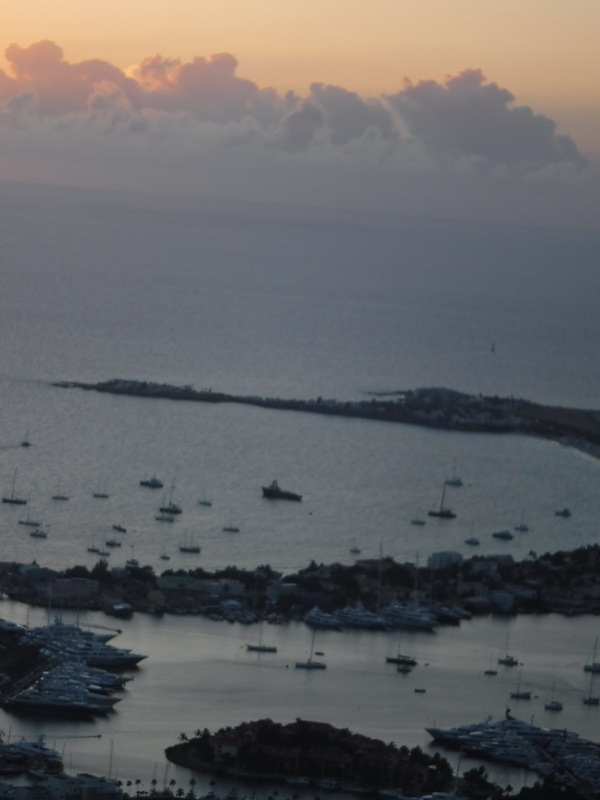 For those of you who could not get the article, or chose to wait to read it another time, he declares that everything in St. Barts costs $17,000, from the smallest purchase of sunscreen to the rental of a car.We have now adopted this as the standard designation of the cost of everything, particularly in St. Barts. The last time I talked about prices I mentioned the "sticker shock" we were getting at restaurants. I believe that St. Barts has cured that. Every other place is cheap in comparison! Ahh, it feels so good to be in the water again! Almost two weeks in the lagoon in St. Maarten where the shallow water, lack of water movement and hundreds of boats make the water unswimmable, the bacterial count is just too high. But now we are moored at Ile Fourchue, about 20 miles SE of Sint Maarten and about 2 miles from St. Barts. 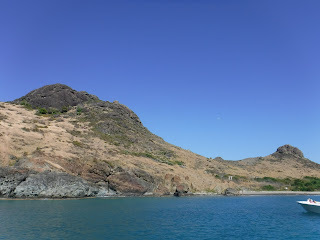 After the lack of swimming off the boat in the lagoon, one of the first things we did after safely mooring the boat was to jump in and swim to shore. Ile Fourchue belongs to St. Barts and is one of their marine reserves. It is a small island denuded by goats whose population died off when the vegetation was gone. They say the vegetation is coming back, but it still looks pretty bare to me, although I did meet a woman who said she had been here 10 years ago and is amazed by how much more growth there is now. All a matter of perspective. 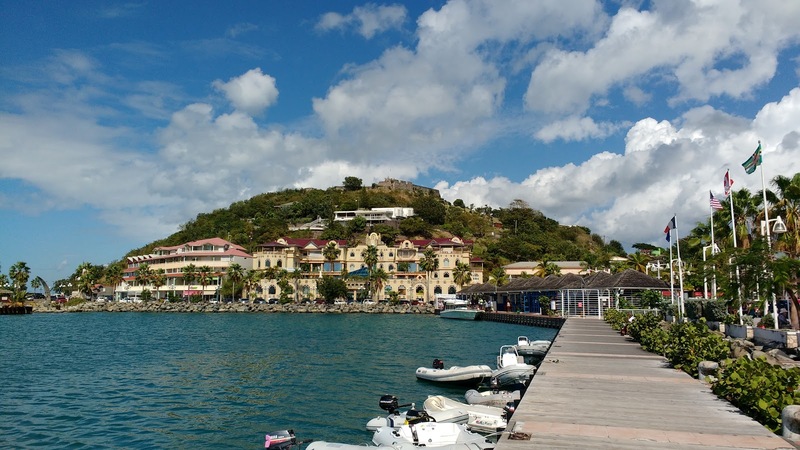 Simpson Bay Lagoon, on the west side of St. Martin /St. Maarten, our home for almost two weeks. We anchored at the end of the runway and next to the causeway that cuts across the lagoon. 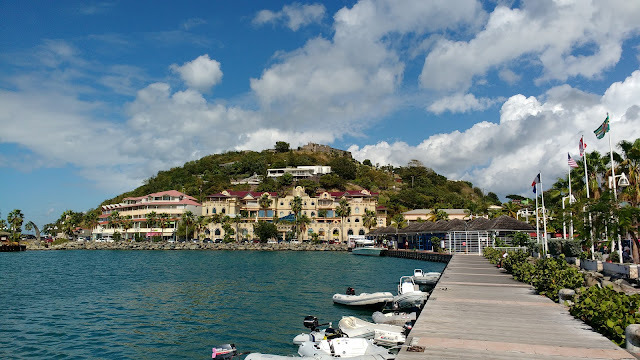 When we arrived in St. Maarten we anchored in Simpson Bay. It is a beautiful blue. The bottom was clearly visible and littered with sea stars. The problem was, it was very rolly. A rolly anchorage is a problem for several reasons. 3) getting on and off the boat from the dinghy can actually be dangerous if the swell is large enough. All of these reasons sent us out of the bay and into the Lagoon. Evening picture taken on the "Hike from Hell"
Our first impressions of St. Maarten (the Dutch side of St. Martin) were through groggy, sleep deprived eyes having motor sailed through the night from the BVI. We arrived on Saturday morning, checked in and did a bit of exploring. The streets are narrow and crowded, the shops are small and close together. This is the section that we have arrived in, and I certainly don't want to judge the rest of St. Martin /St. Maarten by one section of one town. We found a wonderful Indian restaurant for lunch, but as seems to be the case with most restaurants we go to in the Caribbean - when the bill comes it is a bit of sticker shock. I know that this is something that we had figured into our budget, but that does not help that sinking feeling when the bill is presented. The next day was Sunday. A very quiet day. We took our dinghy over to the French side of the island. When taking a cruising boat from one side to the other you have to check out of the first side and check in to the second. If you are on foot, in a car or in a dinghy there is free movement between the sides, no customs, no border checks, no fees. We did not spend much time that day on the French side, just long enough to get some wonderful baguettes, soft cheese and chocolate croissants. 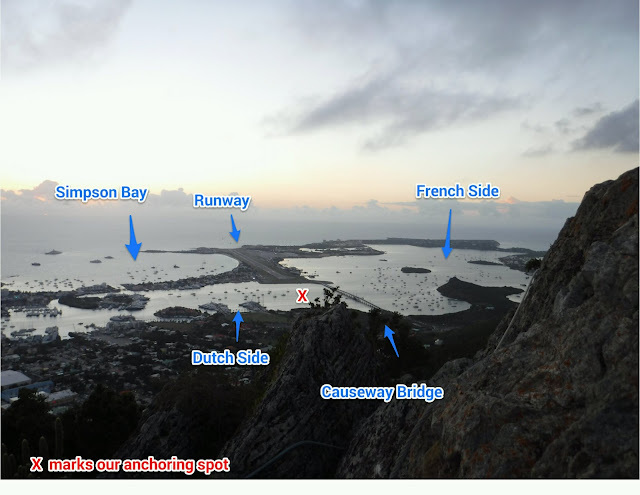 At this point we were wondering just what Sint Maarten had to offer us.